JULIET'S - A monthly gathering of ladies in the church for fellowship and relationship building. The group gathers on the fourth Tuesday of every Month. 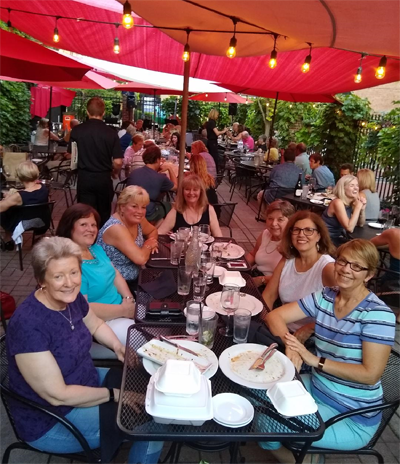 JULIET'S met at Ivy in Wheaton on Tuesday, July 24. The weather was ideal, the food was delicious, Genevieve's Jazz played great music, and the fellowship was joyous. Please join us next month for this lovely monthly dinner! Location has yet to be determined. Men's luncheon: Meets on the second Thursday of every month at Butterfields in Wheaton. Meeting time is 11:30 AM. Please join us.